Season: All year. The trail can get quite crowded on nice days, so head out early. Getting there: Take the Black Mountain Road exit from I-280, turning left going north and right if you’re going south. Turn left on Skyline Boulevard and take it south to where it intersects with Crystal Springs Boulevard. The trailhead is on your right. Skyline Boulevard & Crystal Springs Road, San Mateo, CA 94401. Parking is available on Skyline Boulevard. Much of the trail is shaded by bay laurel trees, including the Jepson Laurel—the oldest and largest in California. Benches are conveniently located along the trail to help you take in the views. Bike Ride Description: The Sawyer Camp Trail used to be the main route between San Francisco and Half Moon Bay. It’s named after Leland Sawyer, who ran a camp for wagon parties headed to the coast. Today it’s a popular paved recreational trail open to walkers, runners and cyclists. Unfortunately, dogs aren’t allowed on this trail so you’ll have to leave your furry friends at home (check out other dog-friendly trails here). Start from the south end of the trail and follow it north along Crystal Springs Reservoir. The twists and turns in the path slow you down a little, but you’ll have more time to appreciate the stunning views of the reservoir and a wall of trees on the opposite bank leading up to the Skyline. At 3.5 miles there’s a rest stop on your left with a bathroom and some picnic tables. You’ll also pass the Jepson Laurel, the oldest and largest bay laurel tree in California. It’s over 600 years old! Take a break here to appreciate the shade offered by this giant tree, or save it for the way back and continue along the trail into a wooded section tucked away from the reservoir. 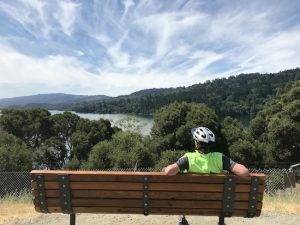 At mile 5 you’ll encounter an uphill section of trail, so gear down before you make your way up to the Crystal Springs Dam for a view of the upper reservoir and the San Andreas Fault stretching out to your right. One last uphill push will take you to mile 6, where there’s a marker to show where Don Gaspar de Portolá, the first European to encounter the San Francisco Bay, camped during his expedition. 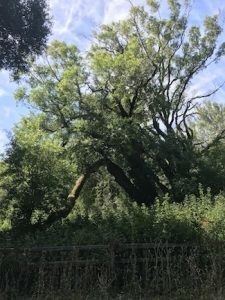 Soon, this trail will be part of the 90-mile Ohlone-Portolá Heritage Trail, which will follow the route he took and focus on the native Ohlone people of the region. 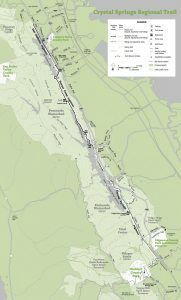 If you want to add another few miles to your ride, follow Skyline Boulevard for .6 miles to where it connects with the San Andreas Trail. Otherwise, come back the way you came, making sure to take in the views and stopping for a water break on one of the well-positioned benches. Enjoy! In 1994, POST protected the 1,252-acre Phleger Estate property just south of the Crystal Springs Reservoir. It is now part of the Golden Gate National Recreational Area, and many of the views from this bike ride are of this property.